This shop is a collaboration of both Ehime and Kagawa prefectures in the rich Setouchi inland sea on the island of Shikoku. Naturally this shop has a wide variety of seafood. Ehime is also famous for its production of mikan, a tangerine like fruit that makes a refreshing juice. There is a restaurant on the second floor, Kaorihime, specializes in udon noodles. 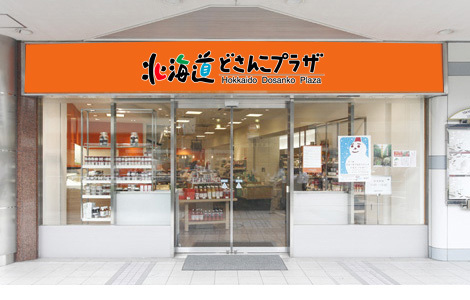 While antenna shops typically represent a prefecture, this shop carries a mishmash of items from all over Japan. The shop is not that organized, so you have to know what you are looking for. There are several antenna shops in the Tokyo Kotsu Kaikan, like Hokkaido, Akita, and many more, so definitely worth spending some time here. 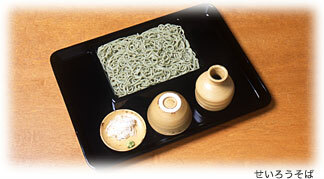 There are a wide variety of items including miso, natto, sake, wagashi, sembei, pickles, and more. Perhaps the most interesting is the selection of miso in the refrigerator section. Customers can taste through a variety of miso before purchasing. Japan is a small country, about the size of California, yet each prefecture and region has its own local food and the Japanese treasure these regional products. There is no better expression of the diverse terroir of Japan than its local commodities. Kombu harvested from the rich mineral waters of Hokkaido. The southern prefecture of Kagoshima is famous for its sweet potatoes, which are the base for its heady imo jochu (sweet potato shochu). Antenna shops act as both stores offering items that are often hard to find outside of the region as well as public relations office offering brochures about the local area. 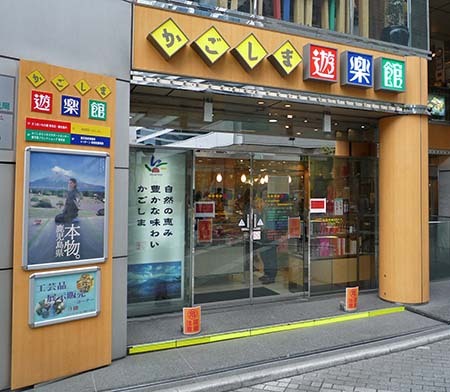 From local beverages like sake or shochu, pickles, sweets and meats, these antenna shops offer great finds and are worth carefully perusing. If you are looking for pottery from a certain region, for example the pastel glazed Hagiyaki from Yamaguchi, then these regional antenna shops are a good place to start. Some shops will have restaurants featuring local foods, kyodo ryori (郷土料理) and these too are a great way to try food you normally would not have the chance to. Kagoshima also on Kyushu is famous for its shochu, in particular imo jochu from sweet potatoes, of which the shop has an unusually large selection. The cuisine is rich with kurobuta (Berkshire pork) products, Satsuma age fish cakes and more. 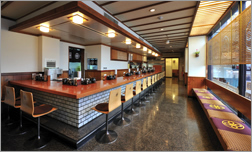 The restaurant on the second floor, Ichi nii san, serves up a kurobuta based menu in a variety of presentations including tonkatsu or shabu-shabu. Elaine Louie, who is a fellow author at The Little Bookroom, has penned this great article for the New York Times on cheap eats in Tokyo. If you have not had tonkatsu in Japan you probably have not experienced the juicy pork cutlet with the crispy panko breaded. This served up with a hot bowl of rice and a large haystack of julienned cabbage does not disappoint. Season the cabbage and pork with some tonkatsu dressing, a dark, sweet, thick sauce (think ketchup and Worcestershire sauce) and dig in. There are many shops in Tokyo, but one of the perennial favorite on any round up of tonkatsu shops consistently has Maisen at the top. 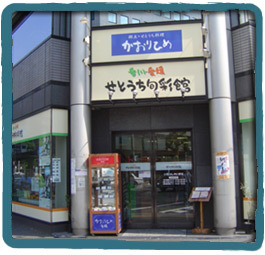 There are many shops, including in depachika for take-out, throughout the city. The main shop, in Aoyama, is a few blocks behind Omotesando Hills, and a short walk from the funky shopping street Takeshita Dori in Harajuku. There are several rooms on the two story shop in Aoyama. This is the main dining room. It used to be a bathhouse. I don’t sense it when I am there, and I don’t know why anyone who writes about it seems to feel like they need to mention it. 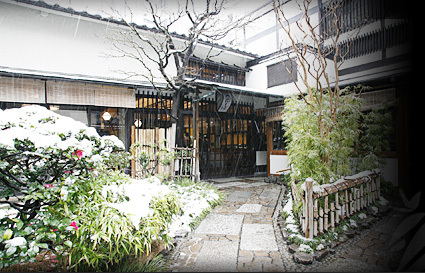 I am including it in this blog so that you can know that yes, this is the tonkatsu shop that used to be a bathhouse. There is usually a line, don’t worry, it moves quickly as it is a large restaurant. This here is the counter and guests are usually lined up on the right hand side along the window. There is also a take-out cart in front of the shop. The tonkatsu sandwich is also popular, fried cutlets with sauce between white bread. I prefer my tonkatsu hot so have not come to understand the popularity of these sandwiches. My recommendation is any small farmed pork on the menu. I have had a great Okinawan pork in the past. Also, be sure to upgrade the soup to a tonjiru, thin slices of pork with vegetables in a miso soup. 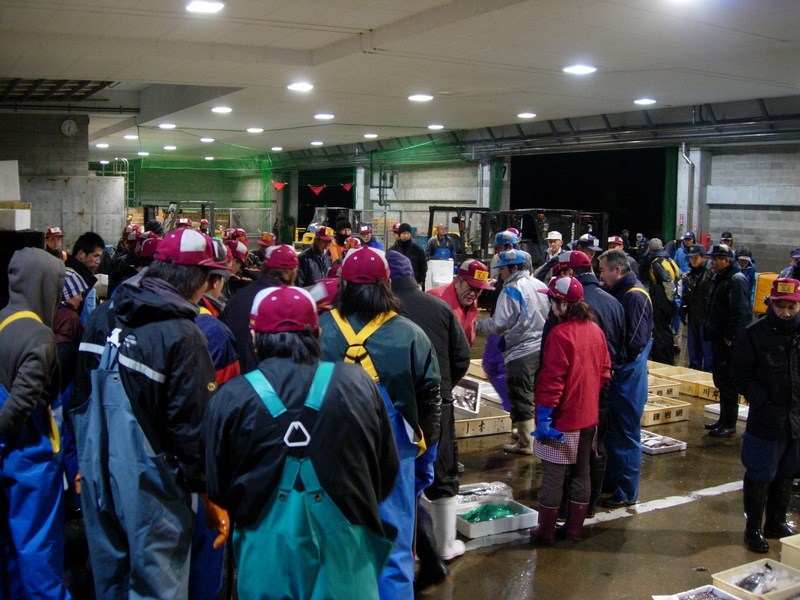 Some more photos of the Himi Seafood Auction in Toyama. If I understand correctly, this is a list of the licensed buyers at the auction. As you can see in photos below, buyers will have a tag, usually on their hat, that auctioneers can recognize that these people are authorized to purchase at the auction. Carefully looking at the board you can find the names of a handful of women. 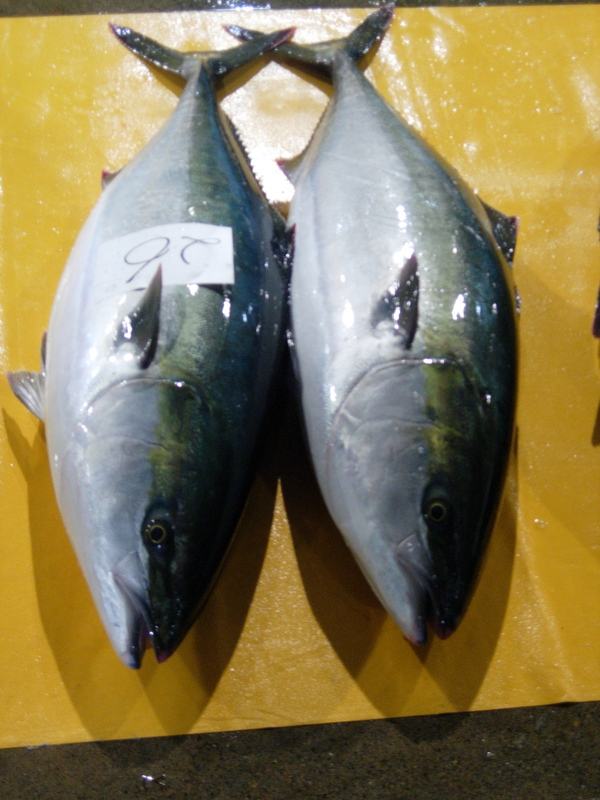 Unlike Tsukiji Market, where most of the seafood comes in by trucks, and even airplanes via Narita and Haneda, most of the fish at the Himi auction were unloaded off of boats and moved just a few feet onto the auction floor. A close up of the auction. 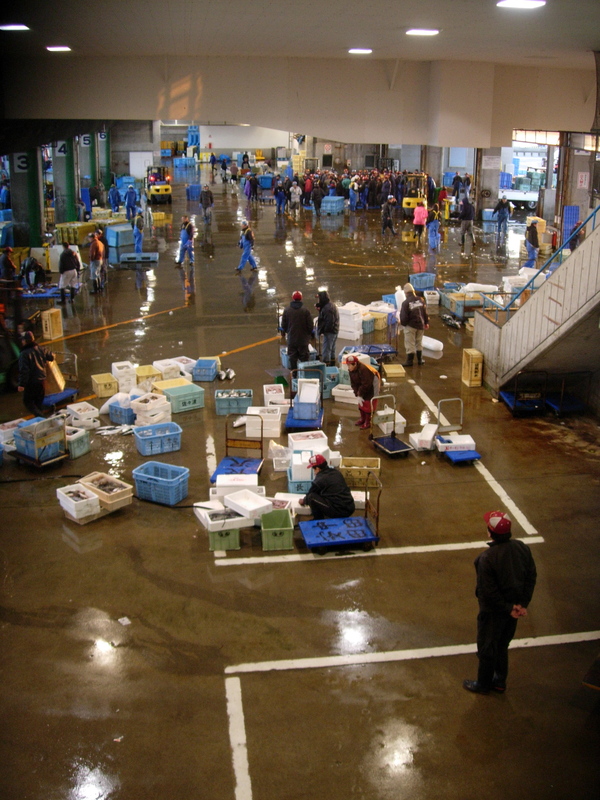 The Himi auction has built a great viewing area for visitors to the market. There is a perch that overlooks the market. It would be great if the new Tsukiji Market could also build something like this. You can see the auction taking place in the upper right of the photos. 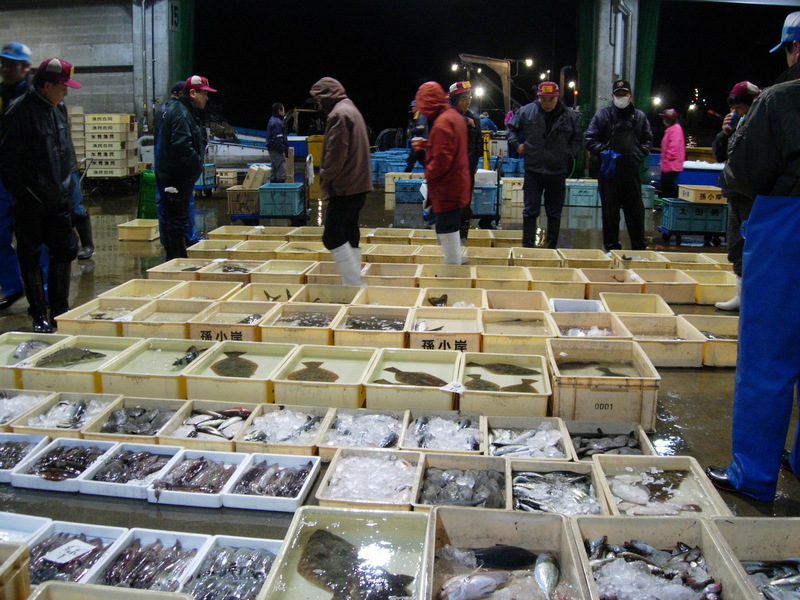 We saw a variety of winter fish including hirame (flounder), octopus, anko (monkfish), saba (mackerel), and the famous kanburi (winter yellowtail). The whole reason we came to the market, to try and eat this fish, one of Shinji’s favorite this time of year. On the second floor of the auction, just off of the viewing perch, is the market’s shokudo, or dining hall. 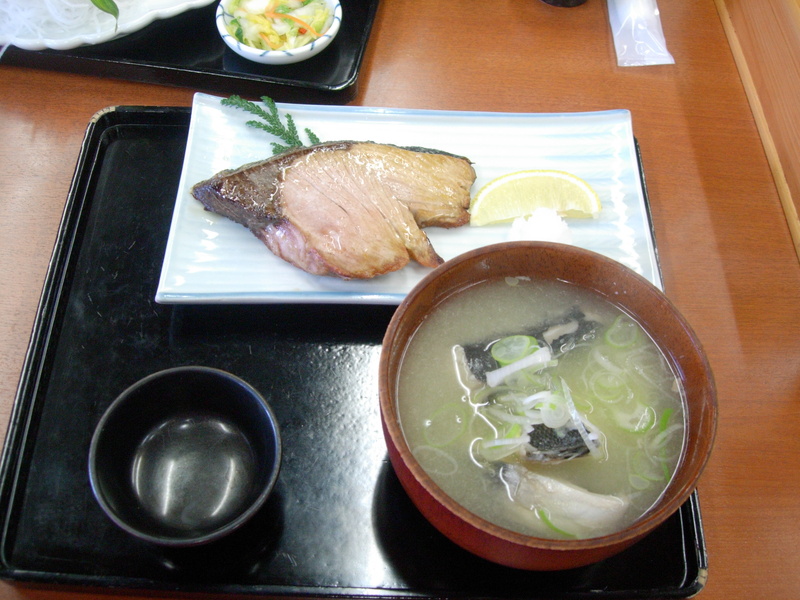 Our breakfast was the local kanburi (winter yellowtail). 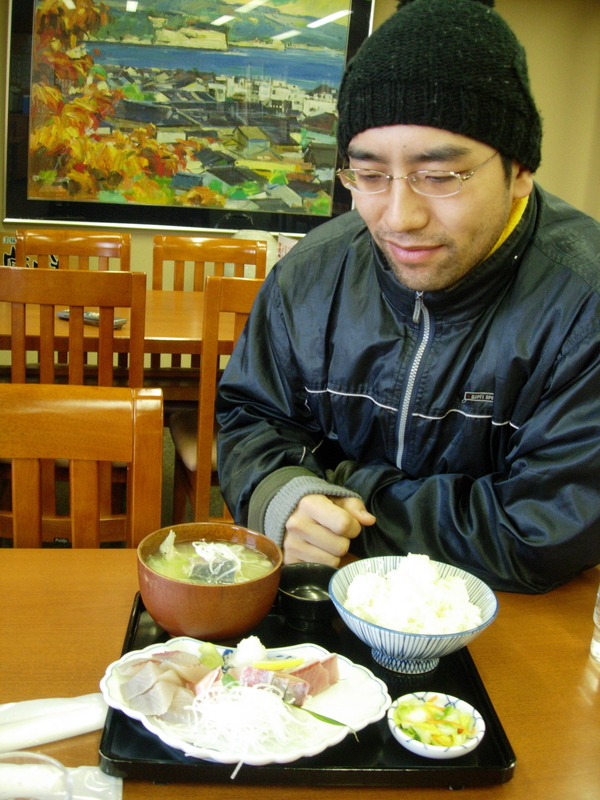 Shinji loved this breakfast – the winter yellowtail, rich in flavor and almost melting in your mouth. A popular way of cooking the kanburi is simply to salt and grill. It is so rich that the meat falls apart. 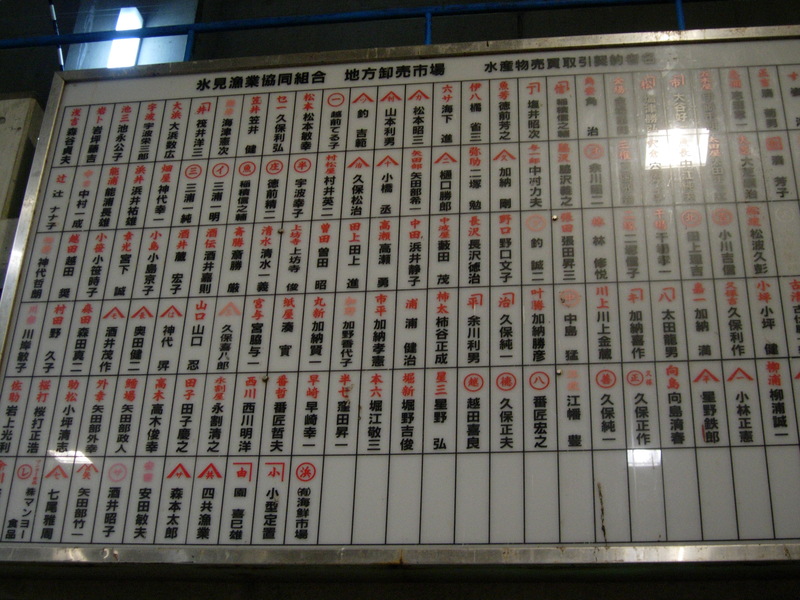 The name of the shokudo at the auction is Kaiho. This is a great destination for any seafood fan. The coastal village of Toyama overlooks the Sea of Japan. 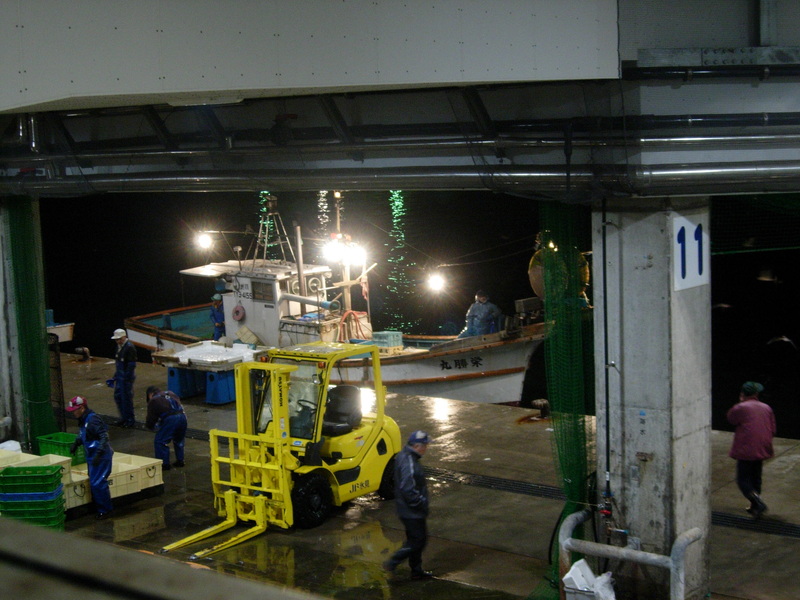 On the coast of Toyama on the Sea of Japan is a famous fishing port. 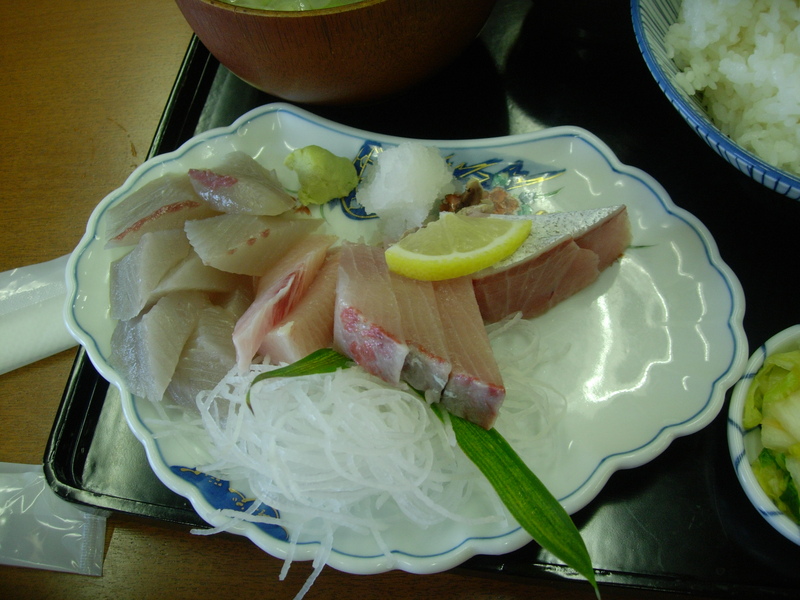 In the winter it is renowned for its kanburi or winter buri (yellowtail). 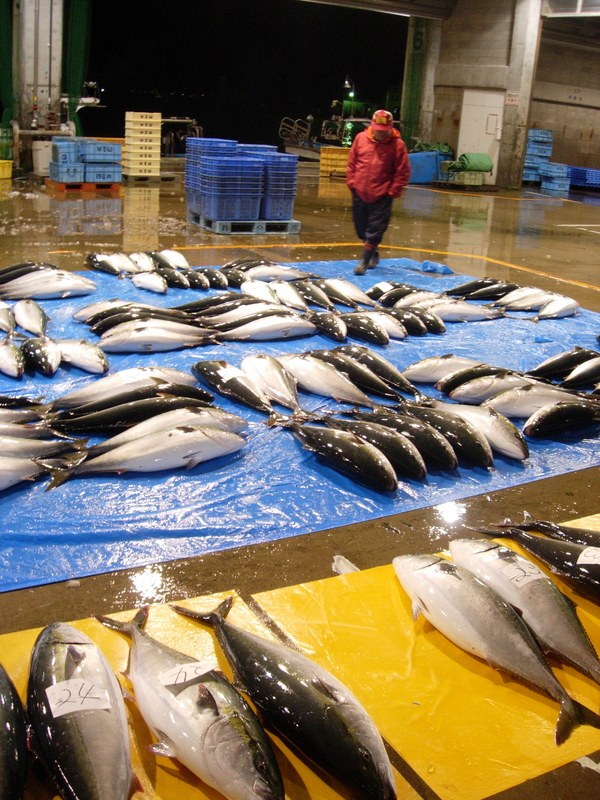 Rich in fat, it melts in your mouth like fatty tuna. 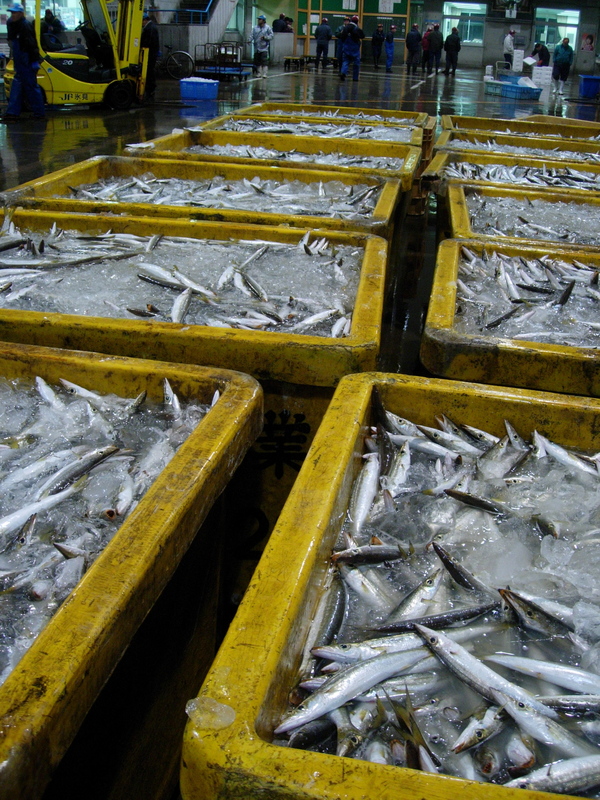 Don’t worry if you miss the early morning auction as there is a retail market next door with several large stalls selling fish caught locally. While barracuda may have the reputation of being an agressive, predatory fish, it is actually quite small in size. The meat is tender and delicate. 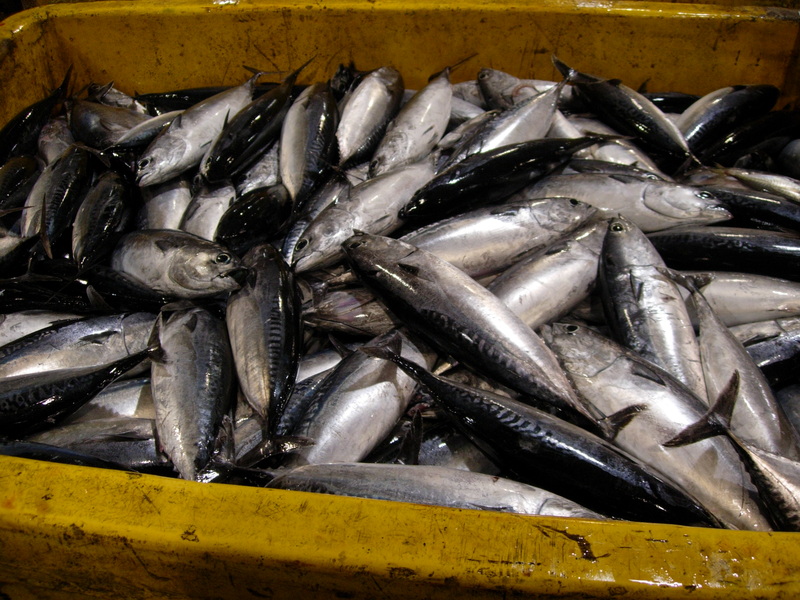 You can see that these mackerel are rich in fat by observing the back area, it is almost bulging from its skin. Here is the famous kanburi, the whole reason for our journey to this famed fishing port. We had some for breakfast and it was amazing, rich, and worth the trip.